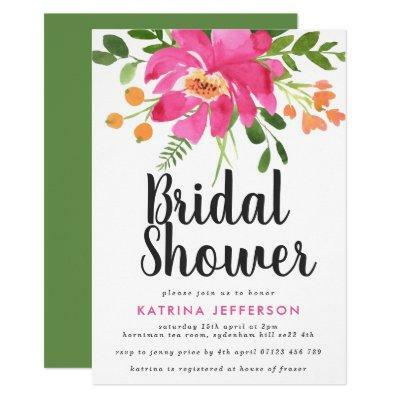 A bright, colorful and modern bridal shower invitation featuring a large bold spray bouquet of watercolor flowers in tropical pink, orange and green. The phrase "bridal shower" is in modern brush lettered style dark gray font, guest of honor in fuchsia pink, and event details in gray in the lower third of the invitation. The back of the invitation is in solid green.